Many years later I find myself the owner of a rental property in Sonoma County. As a landlord in a very tight obscenely-expensive housing market I saw an opportunity to both provide an additional rental unit at a minimum wage price point and make a little extra money for myself. The existing property is a 700 square foot two bedroom tract home that sits on a half acre of land. An additional 300 or 400 square foot cottage in the back garden could be affordable for me to build on a cash basis and affordable for a low income renter – without blighting the rural landscape. It’s technically legal to build a permanent Accessory Dwelling Unit on a proper foundation, but the cost of compliance with endless regulations was ridiculous. A permit is $24,000. There’s an obligation to rip up the street and trench a completely redundant sewer line (minimum $15,000) instead of just tapping the existing sewer from the main house. The code requires fire sprinklers that will come in at about $10,000. The requirement for off-street covered parking means building a garage larger than the cottage itself. Then there’s the internal conflict of many of the codes. Permeable pavement is required for storm water runoff control, but that runoff is caused by the required added driveway and garage. Meanwhile a plain vanilla gravel parking space in the front yard is forbidden. The list is absolutely endless and only a professional architect along with a consulting engineer can possibly understand the entitlement process and all the code minutiae, so factor in those billable hours as well. At the end of the day even a very modest backyard cottage was completely off the table for me. I will not go in to that kind of debt and I won’t tolerate charging the required high rent to service the loan. It’s a lose/lose proposition all around. No thank you. The county eventually realized that all these regulations were contributing to the housing crisis so they came up with a plan to reduce the cost and complexity of building ADUs. But then they loaded up on poison pills that imposed all sorts of other limitations that made it equally unpalatable. There weren’t many takers. Another “lite regulation” option was put in to place that allowed temporary portable cottages for health care workers looking after the elderly or infirm. You need a note from a doctor, regular government inspections, annual fees, and once Granny shuffles off this mortal coil, you need to remove the units from your property. NFW. Since I was avoiding any permanent electric service to work around the dreaded county inspector I’m using 5 watt LED lights plugged in to little USB battery packs. These same batteries also charge iPads, laptops, cell phones and other small devices. I now have light, communications, music, podcasts, and so on, with no need for wall plugs. 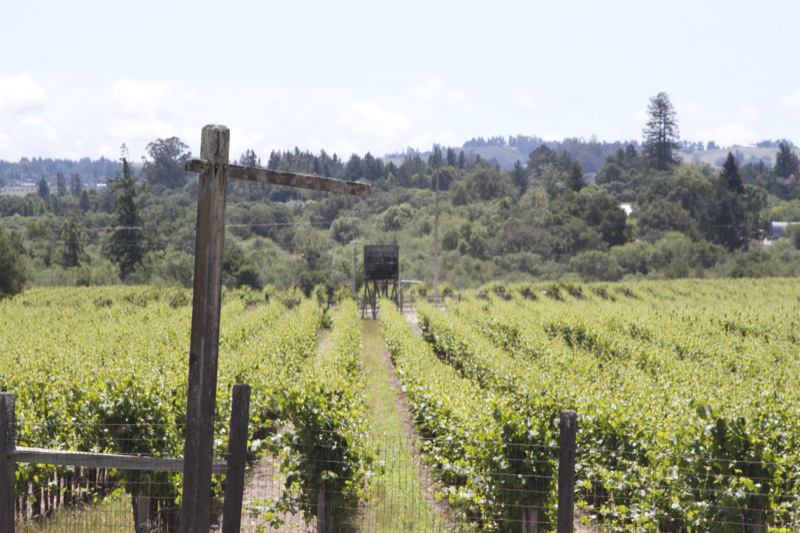 The climate in Sonoma is mild year round so there’s no need for heat or air conditioning. Even in the wet cool winter months proper clothing and a few blankets will keep you warm in bed.